Chiron, a ‘minor planet’ orbiting between Saturn and Uranus, discovered in 1977 and initially classified as an asteroid, is considered by astronomers to be more of a comet these days. Confusing! Astrology is more straightforward. To astrologers, Chiron is said to represent our deepest wound, and our efforts to heal that wound. Chiron was named after the centaur in Greek mythology who was a healer and teacher who could not heal himself. From 1960 to 1968 Chiron was in the sign of Pisces, where he has been again since 2010 (going retrograde in Aquarius from July 20 to February 8 2011) and will be until 2018. Those of us born in the 1960s are going through our CHIRON RETURN. This implies that life is challenging us to face and heal our wounds, such as those above mentioned issues of inadequacy and self-worth, in order to access and develop the healing powers inherent to our unique soul – and, for many of us, to grow into our roles as planetary and soul healers. We were born at a time when in many parts of the world human consciousness was undergoing an awakening and the world was starting to become the connected and information rich place it is today. Our generation has experienced several ‘quickenings’ – early 80s youth culture explosion, late 80s house, rave and ecstasy culture, late 90s millennial rush…. now it’s Chiron’s turn to reveal the next level of our journey as souls born into a culture already becoming conscious. Part of becoming conscious is recognising there is more to life than getting good qualifications, the perfect home and partner: Healing crisis is often the way we learn that the path of life is designed to bring us to a point of soul awakening. We live through highs, lows and loves to discover, develop and become Who We Are. We have to choose to get conscious though, we have to engage the process, or we will return to the cosmos still unaware of the divinity racing within us, crying out to be born. We are children of the Universe and we never stop growing and learning. 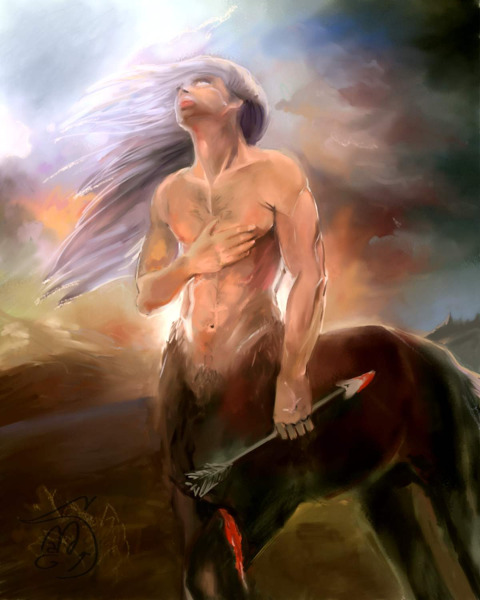 Chiron was the centaur son of the Titan Kronos and nymph Philyra: the Titan’s wife appeared as they were coupling – to escape he transformed himself into a horse and so sired a half-man half-horse son. More centaurs came along later, and were known for being raucous, intoxicated, party creatures, but Chiron was the eldest, famed for his healing and teaching skills. He gained the title ‘Wounded Healer’ because although immortal he received a wound from an arrow of Hercules that could not be healed. So what has being born with Chiron in Pisces given us to work with? “There is a common thread running between Chiron and Pisces: the potential for suffering. If Pisces believes that suffering is noble and Chiron experiences suffering as unavoidable, their combination could amplify the experience and idealization of suffering. A spiritual approach to Chiron in Pisces might want to regard suffering as a noble end in itself. However, there is a risk of becoming stuck in one’s suffering and pain. The danger lies in believing that if you’re not suffering, it must mean you’re not working hard enough on whatever wounds or shortcomings you’re trying to resolve or heal. “A more practical (and in many ways healthier) perspective might be to treat suffering not as an end in itself, but as a symptom meant to inspire an end to suffering. This could be tricky if Chiron’s contribution of “the wound that cannot heal” makes it impossible to resolve or even lessen the problem. That’s when it becomes necessary to focus beyond your immediate discomfort and be willing to find a level of acceptance as expressed in the Serenity Prayer – not to resign yourself to helpless misery and not to cling to an illusion of having absolute control over eradicating the problem, but to work with the dilemma. To some extent and in some way, it may be necessary to simply find a way to co-exist with the problem so that you retain your integrity, uniqueness and strength while also accepting that you are not all-powerful. We are all co-drivers of physical reality, and sometimes that means we must share the driver’s seat. these quotations reflect much that i see in my generation. We have to work out our relationship with suffering and limitation, we were perhaps the first generation to suffer a mass disappointment in and disullisionment around religion. We largely gave up on the faith that had given strength to previous generations (eg the strength to get through the world wars), and although we have done much to replace that faith with substances, love affairs and material wealth, we are, i suggest, a generally existentially challenged and confused generation. At around the age of 50-51 we undergo our Chiron Return. This is a moment of taking stock, working out how well we have been doing with addressing and moving through our life wounds, finding out what we could do better – and accepting with serenity that which cannot be healed. This is what brings us a calmer approach to life in the sixth decade. Chiron is a God and he teaches us to keep our lives connected to the bigger picture of consciousness and spirit, however we wish to perceive or personify that. We may have given up on religion, but sooner or later we perhaps work out that we still need Spirit. To the compassionate unity of Spirit we can surrender the things we cannot change or heal, from it we can receive love as we surrender our need to be always in control of our lives, knowing that we are held forever in its unconditional embrace, sensing that we are on a healing journey to a wiser, more fulfiling stage of our lives. ← The beginning of the end for HIV?